Assume that our enterprise is assigned a public IP address range of 50.50.50.0/27 (that is a 32 address subnet). The usable addresses in this subnet range between 50.50.50.1 and 50.50.50.30. In our example we assign 50.50.50.1 to the outside interface of the Cisco router and 50.50.50.2 is the ISP gateway router. Also, we need to use address 50.50.50.3 for accessing a DMZ web server which has a real private address of 10.10.10.1. Between the Cisco Router and the outside interface of the Cisco ASA we have a private subnet 10.0.0.0/24. Also, the inside internal LAN subnet is 192.168.1.0/24. The inside IP address of the ASA is 192.168.1.1. 1) All Internal LAN hosts (192.168.1.0) should be able to access the Internet (outbound communication). No access initiated from the Internet should be allowed towards the Internal LAN network. 2) Also, we need to allow access from the Internet towards our DMZ Web Server (inbound communication). There are a few ways you can follow to achieve the functionality above. For sure we need to perform NAT on the border Cisco Router to translate our internal private addresses to public addresses assigned by our ISP. We have the option also to perform additional NAT on the ASA firewall, which however we wouldn’t recommend. 1) For outbound communication (Internal LAN towards the Internet), do not translate the network 192.168.1.0/24 on the Cisco ASA. 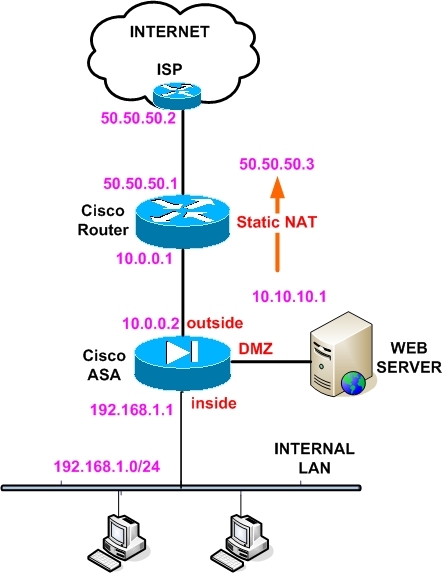 Rather create a static mapping of 192.168.1.0 to itself (will see this below) and configure NAT overload on the Cisco Router for the network 192.168.1.0/24. Below we will show you snapshots of the configuration for both the Cisco Router and the Cisco ASA that will achieve the functionality above.